Join us for a fab evening of fashion. With both adults and children’s ranges from M&Co being modelled, you will definitely find a way to spend your discount voucher(given to you on the night)! We will also have nibbles and a raffle for you to enjoy at your leisure! £3 ticket includes entry, nibbles and discount voucher. Purchase from Lifespan or M&Co. Pre-purchase preferred for catering. Splitz annual dance show is always a fab evening of entertainment from dancing through to a fashion show! 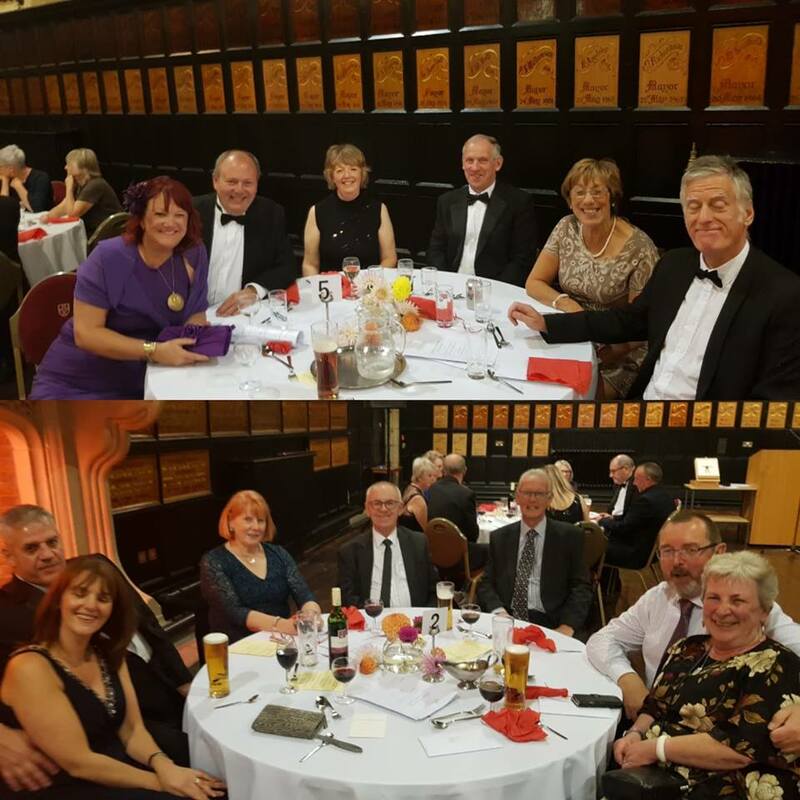 We are running the raffle for this years show, so why not grab a ticket from Lifespan or Judith (Splitz Teacher & founder) and enjoy a fab evening whilst supporting a local charity with a raffle ticket or two! Karen Thompson and Gillian Coates provide us with a wonderful demonstration of their artwork while we enjoy a sparkling afternoon tea at Crook Hall & Gardens, raising funds for North East Charity; Lifespan Complementary, supporting those with terminal illness. Join our local producers and crafters at this fantastic Summer Bazaar! FREE ENTRY and a light lunch available to purchase. Bring the family and enjoy the beautiful weather (hopefully) outside after exploring the hall full of wonders inside! Join us as we celebrate our 14th year with a 3 course dinner, drink on arrival, silent auction and live entertainment from Stratosphonic! Set in a beautiful hotel with a black tie theme, this evening is a wonderful occasion to help us celebrate! £30 per ticket when booked before 30th June 2019, £35 after this date. Ticket includes welcome drink, 3 course dinner, silent auction & live band. Contact Lifespan to book your tickets, please notify us at the time of booking about any food allergies/intolerances etc. A huge thank you to everyone who came to our afternoon tea event on Saturday in Stocksfield Methodist Church. You have helped raise an incredible £402!!! The event would not have been possible without the help of our fantastic volunteers who helped set up, bake cakes & scones, make sandwiches and serve on the day! We also need to thank the Branch End Spar in Stocksfield for their generous tea/coffee/sugar/biscuit donation and the Northumbrianpedigree 🐮 herd up at Slaley for their fresh milk & cream! Don't forget to check out our upcoming events on our website and Facebook page! Join us for a wonderful afternoon tea in this beautiful setting. Why not treat that special lady in your life with mothers day being the next day? Thank you to everyone who came on 2nd March! You helped raise a fantastic £226.13! Check out our future events, it would be great to see you again! Come and have an entertaining evening started off with gin tasting! Join Gin & Tonia as they take you on a tasty journey with 3 different gins (option to purchase extra gin available) and enjoy a buffet as you travel! Then to finish off the evening we have the beautiful voice of Emma Smith. Tickets include gin tasting, 2 course buffet and singer - £15 each. With the help of donations from local Slimming World members, Lifespan will be holding a tombola stall full of SWEET TREATS! The syn bin fundraiser is a combined effort between local Slimming World groups and Lifespan. Come down and try your luck whilst raising funds for a local charity. Join us for a new year table top sale with FREE ENTRY. With table top stalls and traders, you are sure to find something you like! Bacon sarnies will be available to purchase along with tea/coffee etc. You have helped us raise a FANTASTIC £913! Thank you for your support! Our annual Christmas raffle tickets are on sale! 50p per ticket or £2.50 per book. Contact the office via email or phone to get yours or pick them up at one of our events below! All ticket stubbs to be returned to the office by 7th December for the ticket draw on 11th December 2018. A festive afternoon for you and your family/friends! Come and join us at Stocksfield SICA for a seasonally themed afternoon with Broomley First School choir are joining us to provide us with some entertainment. Refreshments are available to purchase and some festive stalls will be selling their wares. Come along to a fantastic fashion show, hosted by M&Co Hexham! Some great fashions for adults and children and some great bargains including a discount on the night! Tickets will be available to purchase from M&Co in store - £3 each with all funds going to Lifespan. Nibbles & refreshments are included in your ticket. Come and have a mooch around the various jumble and trader sale stalls then grab a bacon sarnie afterwards! Sale opens at 10am at Bardon Mill Village Hall. 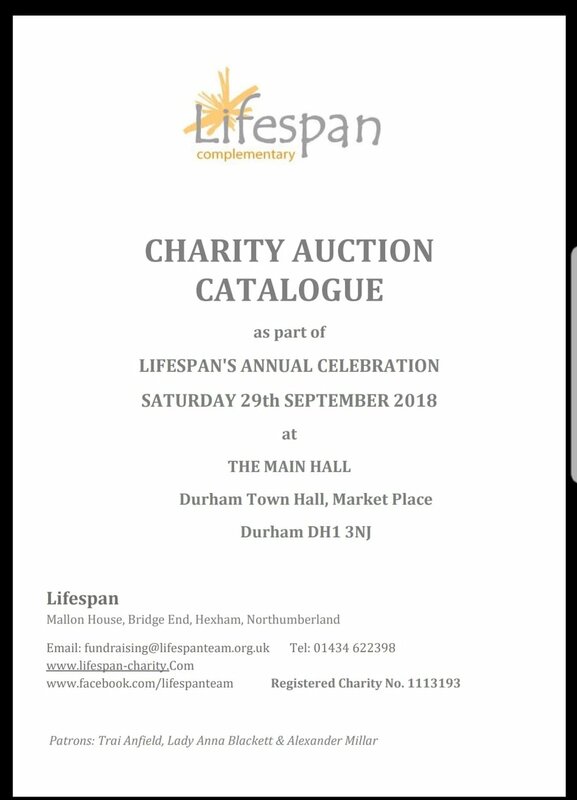 Please contact Lifespan if you wish to have a table (jumble or trader) at the event. 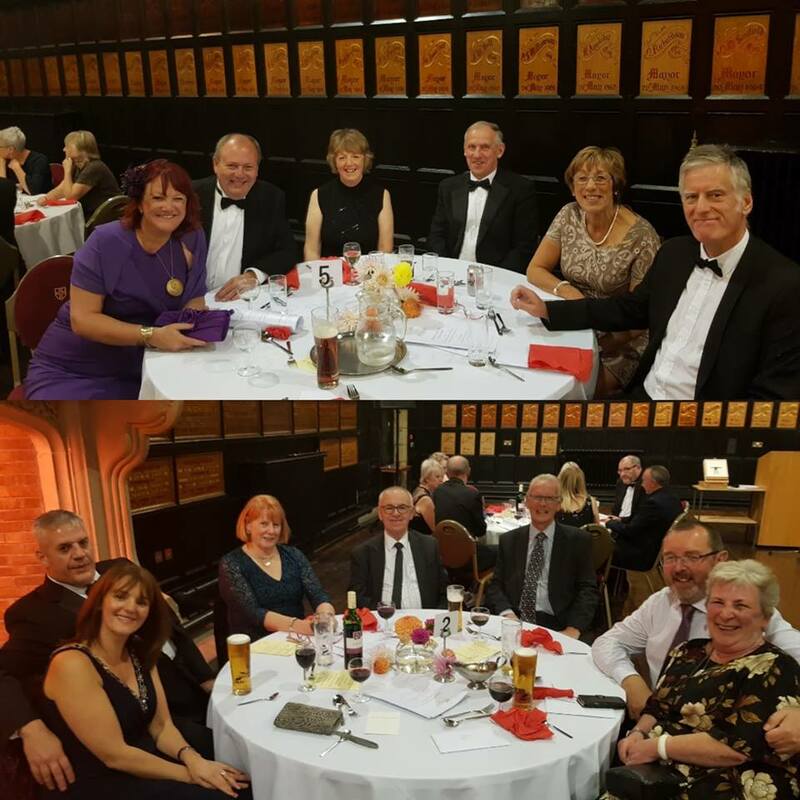 Last night was our annual celebration & dinner at Durham Town Hall. 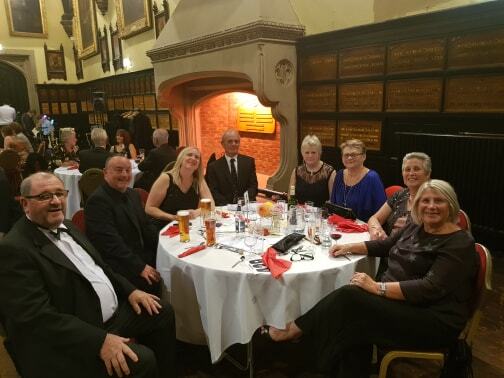 It was a great night and we shall know on Monday as to how much was raised but we must say Thank you to so many people, this will be like an Oscar speech and I apologies if I forget anyone on this first draft. Firstly thank you to every one who donated to our silent Auction and to our live auction, we are so grateful, as without this we, well we couldn’t have had an auction but obviously this brings in a great amount of money for us. Thank you to everyone who donated a prize for our Promise Tree. Thank you to Beveridge’s nursery, Ebchester for the lovely donation of dahlias for our tables. Thank you to all of the fantastic staff at Durham Town Hall, everyone was so friendly and helpful. Thank you to Paul Richardson and his catering students from New College Durham, who did a fantastic job of making and serving the delicious food. Thank you to Gerry Jackson for hosting our event and live auction. Thank you to Stratosphonic for entertaining us all. 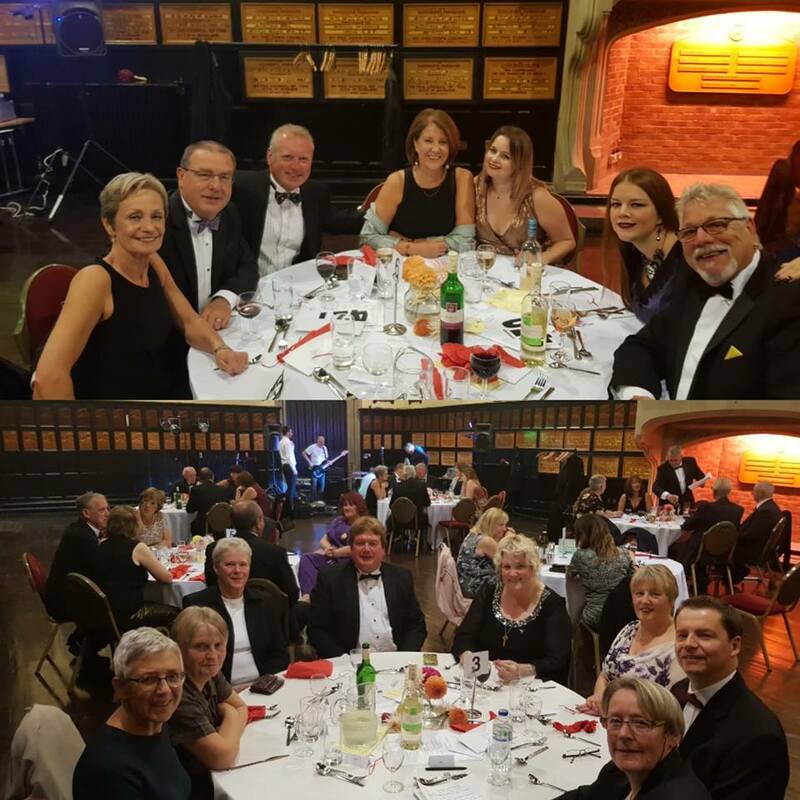 Thank you to all of our wonderful guests for coming along to the event and supporting Lifespan, you made it a fantastic night for us all. 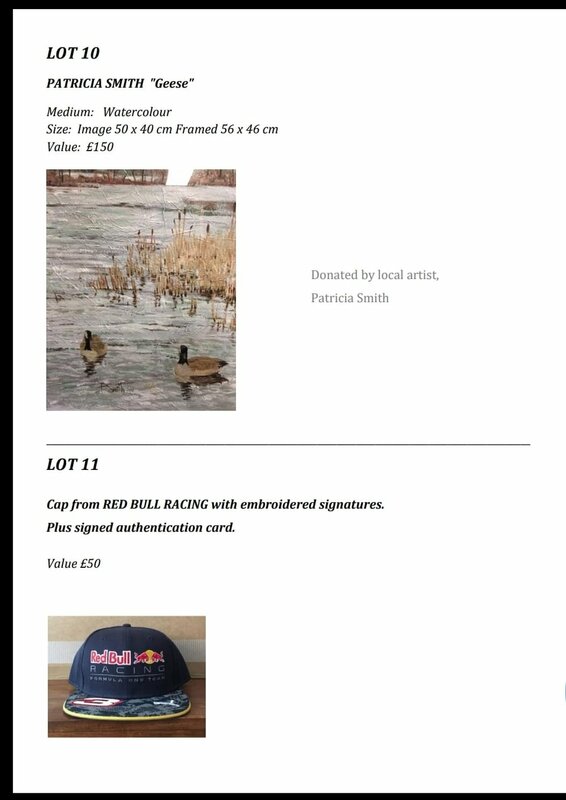 Thank you to Lesley and Linda for setting up the art auction lots. I have added some photos, so sorry but I didn’t manage to get a photo of one table, as the two times I was going to, someone was missing from the table, then I clearly forgot, sorry. Come and join us for an afternoon of Bingo followed by some light entertainment. We will be serving some refreshments including a buffet, soft drinks, hot drinks and some alcohol beverages. There will be a entrance fee, more information to come soon. Come along and join us for our coffee morning, there will be refreshments including hot drinks and cake along with a Tombola. We will be at the fabulous Bardon mill Village Hall on the following two dates, it is a great venue, there is a huge field and park just outside of the hall, making it the perfect place to bring the whole family. there will be refreshments and cakes available to buy along with a tombola. Entry is FREE. Tuesday 28th August 10-12pm There will also be a craft stall at this event.